I have fellow New Mexico gold miner "Rattlesnake Jim" to thank for this post, since he's the one who clued me in about the Gold Claimer brand gold trommel/concentrator . "Jim" is as experienced as they come when it comes to all things mining and he says he's been using this this piece of mining equipment on his claim for about 2 years now. Since I know that "Jim" knows what he's talking about, I'll just leave it at that. Did I just say dry placers? Yep, I did indeed. 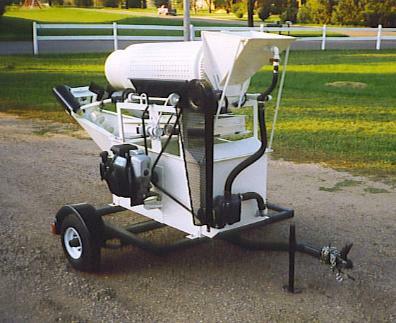 The Gold Claimer employs a unique water supply and reclamation unit that allows you to run this trommel where there is no water available. In other words, the Gold Claimer can recirculate your existing water supply. By the way, you should know that the length of time you can actually recirculate a limited water supply using any piece of mining equipment is somewhat dependent on whether you can add additional "clean" water at some point(s) during your mining operations. I've used recirculating equipment systems in dry areas in the past and they work great until the recirculated water gets so dirty it takes on the consistency of mud. Then all gold recovery bets are off my friend. Next, the material is classified or screened by 3/8” diameter holes where any material smaller than that gets washed down onto an oscillating sluice box and any larger material works its way to the end of the trommel. A nugget trap then catches any heavies or coarser gold while lighter material is discharged from the tail cone to the rock chute and discard tray. You can set the Gold Claimer's oscillating sluice to one of three stroke settings: stationary, short, or long strokes (1-15 pulses per minute depending on which setting you choose). The removable sluice box is lined with artificial turf (for fine gold entrapment), standard riffles mounted on expanded metal, and 4 toggles to secure these elements. Any lighter material that gets washed off the sluice goes into the de-watering screw, which is the most efficient means of removing solids from water so that you can recirculate that same water. The unit's auger is raised from the bottom and this forms a "black sand trap" as well as a secondary gold recovery area just in case your water flow is too fast and high over the sluice. If you liked this post, you may want to read: "Take Heart and Keep the Faith"